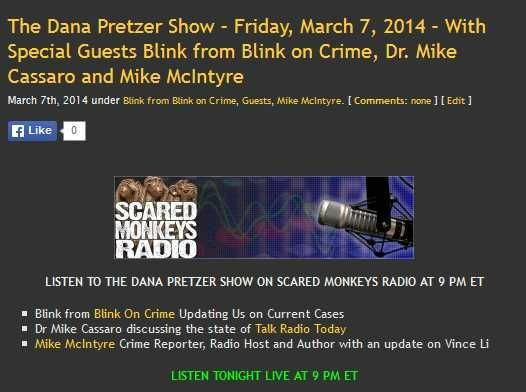 Join S. Christina Stoy, Editor In Chief of www.blinkoncrime.com LIVE Tonight on THE DANA PRETZER SHOW beginning at 9 PM. “Blink” will be discussing case developments in The Holly Bobo murder indictment, upcoming news in the Jennifer Kesse disappearance and other current cases. A good discussion with Dana B. I am very surprised that finally there may be some arrests and convictions beyond the one currently charged. A “meth head” and his buddies of similar behavior are probably responsible. For the family’s sake, I hope that LE can find Holly. This case has taken a long time to reach the current status. I was pleased to learn that Greta Van Sustren is doing a special on the Kessie case. Greta does a good job without becoming flamboyant. Mark Furman often appears on her show. Did I understand correctly that you may play a part in this special? I would love to see that happen. Thanks for your compliment to all the readers and posters of Blink on Crime. Thank you ATG- I totally agree with you on Greta- I have been interviewed at length so far for background and re my published work on her case, yes, but I can’t say yet if I will appear on the show as these things go, lol. I will say that it was very refreshing that her producers had done extensive research prior to discussions with me about the case. I meant what I said emphatically- there are some of the sharpest advocates and true crime followers I have ever seen on SM and BOC. Great show, Blink and Dana! Looking forward to Greta’s show on Jennifer Kesse. You have me very interested in her approach into covering her disappearance. Don’t forget to breathe, sister friendLY. Thank you my dearest friendLY. Blink, I listened to the show and wasn’t going to comment since I know little of the two cases discussed, though I am so glad an arrest was made, it gives all cases some hope. Just wanted to say thank you for the group complement and including us in this forum. Hope your work load lightens up. Blessings in the new home. Does Harper like the new digs? It is my sincere pleasure to complement you all – it is well deserved. To your point, I think it is a difficult admission for me to say that closing a case that I have worked on is the fuel that keeps the fire burning so to speak- but it is true. Hope is a requirement in this work. Blink, I look forward to seeing your next posts on Holly Bobo and Jennifer Kesse when they happen, and also on any developments re: McStays. Jennifer Kesse was one of the first missing persons cases that originally drew me to first to Websleuths and then to your site, and I also want nothing more than for her to be found. and re: Holly Bobo, as you mentioned, if there is going to be more than one arrest…with more than one perp, I shudder to think of what her last moments must have been like, that they were more horrifying than I ever imagined. From blink: Ty Lindsay, I believe that is absolutely the case for Holly, unfortunately. Just inquiring about the Greta program and the date it’s expected to air. I don’t recall if you mentioned those details or not. I have not received the air date Ragdoll, when I do, I will post immediately. I think of little Kyron at least once a week when I drop my kids off at school. All those little monkeys running around and the parents just drop them in the parking lot and drive away. Yes, in the simplicity of every day- a predator was anything but simplistic. Today because I am feeling the allergy alert like cray- I forgot my iphone when leaving the house to drop the kids off at school. I had hours of errands after that, visit to Dad’s – my home away from home the home renovation stores ( I don’t promote, you know who they are, lol). I remember being keenly aware of the fact that if something happened, I had no access. I was more present and alert to my surroundings than I usually am, etc. I could not help but think- are there offenders in my periphery taking note that I am not texting or looking at images on my phone for project needs, blah blah. If anyone reading this is not working at being vigilant- or listening to their Gifts of Fear- I pray that you start. There could have been people watching Blink during her errands. However, these people are looking for someone who is not alert to be their victim. Scanning the area you are about to enter to see who is there and not forgetting the areas to either side should be a habit everyone should develop. Parking lots of big box stores and schools are places that have potential for danger. Look for people who seem to just be loitering around and let them know that you have them in your sight by looking directly at them. Always be alert to your personal safety when out and about. Oh Lord a mass stabbing at a highschool in Pennsylvania…Blink, you moved to Penn. recently….Please tell me you and yours are ok. Worried. Thank you kindly- Bucks, this was about 4-ish hours away from me in Western PA. This incident was in a small city of 30,000 East of Pittsburg and NE of Greensburg on I-76. This is just another incident of school children taking out their anger on their peers. This time with a knife. This is proof that guns and knives do not maim or kill, but people do. We need to do something meaningful about teaching young people how to better protect themselves. Two big boys that were not afraid and trained could have taken this sick one down and saved a few from his terror. This could possibly be something related to a youth on Psychotropic drugs. I hope they do enough investigating to find the source of his behavior. I thought you might be closer to New Jersey…Glad everything is ok.
Yep, and again, thank you. The Relisha Rudd disappearance is killing me. Poor little sweetie. A few questions for you, Blink. Just wondering if you’ve been following the Jared Remy case in Boston, and had any thoughts on it. Also wondering if there will be an upcoming posts or updates on cases? Also, do you know when the Greta van Susteren Jennifer Kesse special is supposed to air? Will be doing a separate post, but this Friday at 7PM, airing again at 2AM. I watched the entire show. Not very much new information. Greta did not mention our Blink or any of her work. Disappointment there. They did show the 300 acre track that we all looked at last year using Google Earth. How thorough was the search? IDK. I am hopeful that Greta’s coverage results in developing leads. I am not thrilled that spending several hours with producers on exclusive published content ends up on the cutting room floor. One of the reasons I agreed to speak to the researchers/producers was because I truly felt that the piece was being engineered as “Investigative”, not a review of the case which as you point out, was exactly what it was. It outright ommitted what I believe to be pertinent leads in order to define the format. There were several factual errors. With an 8 year old case- is that responsible? I stand by my work in this case and have met my commitments with OPD and my sources. But above all- I have met my commitments to Jennifer Kesse today and going forward and will continue to do so. This is a solvable case. The new detective reporting to an original detective- really? If this was a corporation that would be an SCC flag. Since the Greta show was so much a review and contained factual errors, I hope she or her staff will read these comments and learn something from them. Yes, her show was mostly a total review of some of the information, but almost nothing new. The only thing I saw was the shot of the ring binders containing the case materials and a reference to the number of people and agencies who worked on the case. The only value I saw was the fact that she brought an old case to the attention of the public. IMO, the Orlando PD needs to revamp their procedures for assignment of detectives to a case and NEVER have a turn over of case materials to a detective that reports to one who was previously in charge. This is practically a guaranteed way to prevent a proper review and new thinking that could possibly solve it. Moreover, you can’t have the detectives that were/are firm in theory presenting to a SMART team 12 times and not ask the question- are we presenting objective data here? My Dearest VP- I pray to the man I never get caught up in it. I know my role in all of this, and I also know he dictates the outcome. I admit frustration because I truly believe that this is a solvable case and Jennifer needs to be found. Discouragement is not an option.